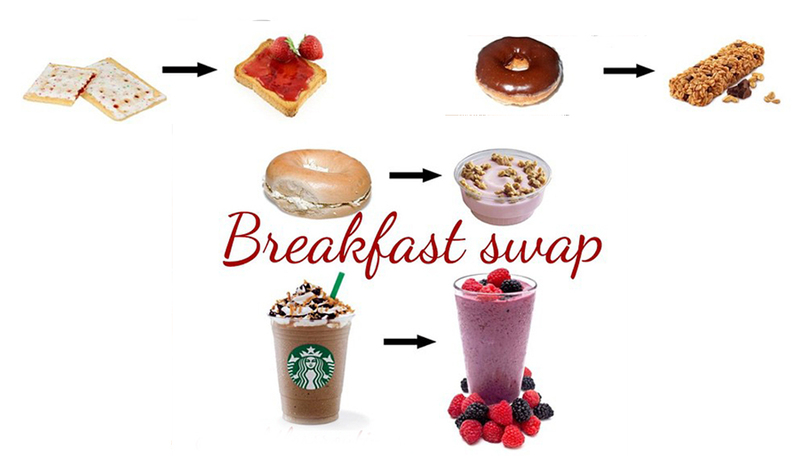 Breakfast swap- make a healthy change in your breakfast. Something as simple as swapping out your breakfast for healthier foods can go a long way in helping to maintain a healthy and fit lifestyle. Instead of a chocolate donut, swap for a chocolate-chip granola bar. Have a taste for a strawberry poptart? Those poptarts have 200 calories each tart. Swap those pop-tarts for a slice of toast with strawberry jam. Bagel with cream cheese? How about a Greek yogurt with granola. Just because the Starbucks is on your way to work doesn’t mean you need to stop there. Switch that latte with a fruit smoothie. Just as tasty, gives you a boost of energy and won’t give you that bloating feeling in a few hours.